A recent visit to Copper and Spices , a Southern Asian Restaurant run by Head Chef owner Nitin Gautamn and his charming wife Carmel, in Navan, County Meath was an evening of fantastic food and service. We were warmly welcome to the restaurant on a balmy summer evening to the traditional folk beat of Bangra music. This immediately put us in the mood and expectation of things to come. The dining area itself is very cosy and elegant, with a touch of ethnic Indian decor without going overboard. The menu here is simple, clear and straight to the point and devoid of any complicated description. I liked that. I also liked the mention of the provenance of the produce on the menu and was glad to see that most were locally sourced from Keelaghan Meats in Ashbourne, McCormack farms in Kiltale, Sean Mcgrane Butchers in Navan, Connolly's fish in Navan and Burke's farm in Tara, while all their Spices are roasted and blended in their own kitchen. We started our meal with an Amuse bouche of Semolina and Durum Wheat Puffs, Sweet Tamarind & Mango while sipping an Alla Costeria Vino Spumante from Italy. 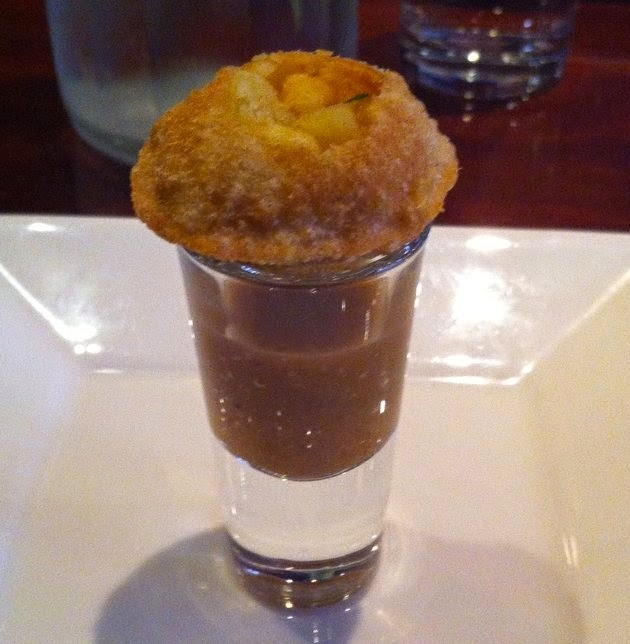 This extra dry prosecco complimented the Semolina and Durum Wheat Puff which true to it's name, exploded in a light and crispy bite while the accompanying sweet tamarind and mango shot just made our taste buds tingle with delight. 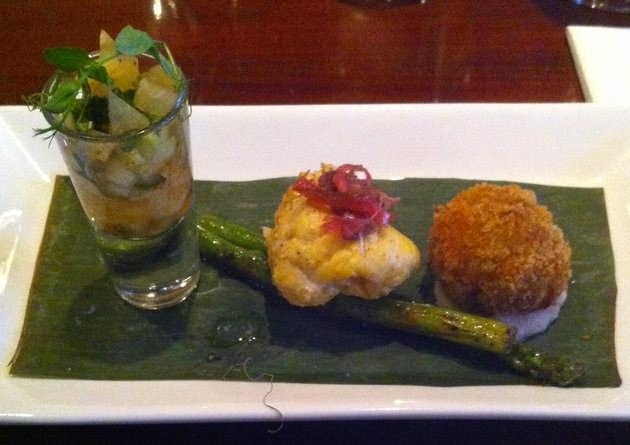 We continued with a starter of Tandoor Baked Monk fish, Mustard and Curry Crab Croquettes & Fruity Salsa. The monk fish was very moist but lacking in flavour. On the other hand the Crab croquette was just divine. It was a sphere of pure delight for crab lovers, sweet crab meat and delicately spiced with mustard and curry. 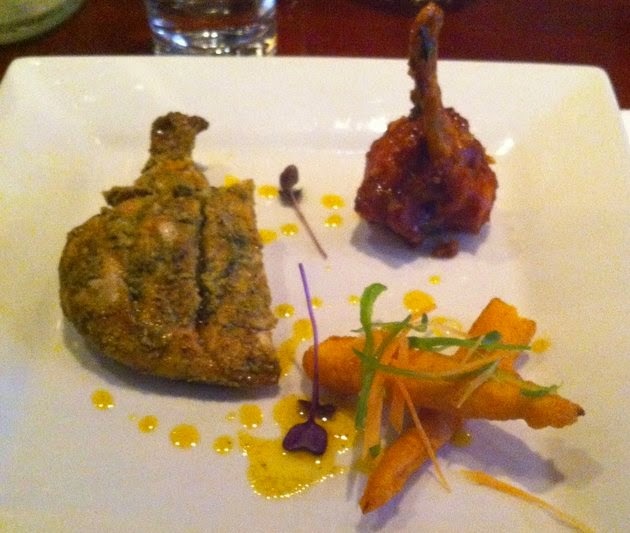 Coriander Taste Supreme of Chicken, Crispy fried wings & sweet potato fries followed. 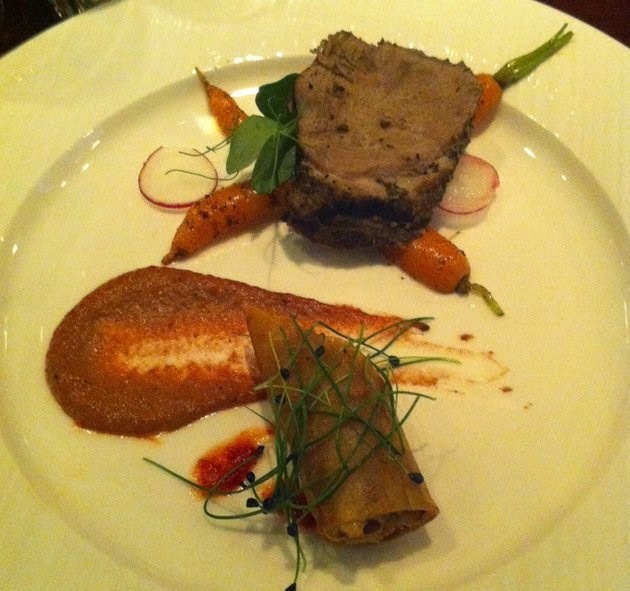 With a little basil sorbet to cleanse the palate, we proceeded to a Cinnamon Infused Duck, glazed carrots, Five spice Duck Roll. This dish was a nice balance of Spices and sweetness. A fusion of Southern India and China. They complimented each other very well and the Duck roll was remarkably delicious. Here we drank a Riesling, dry with honey flavour and clean palate, it was spot on with this dish. 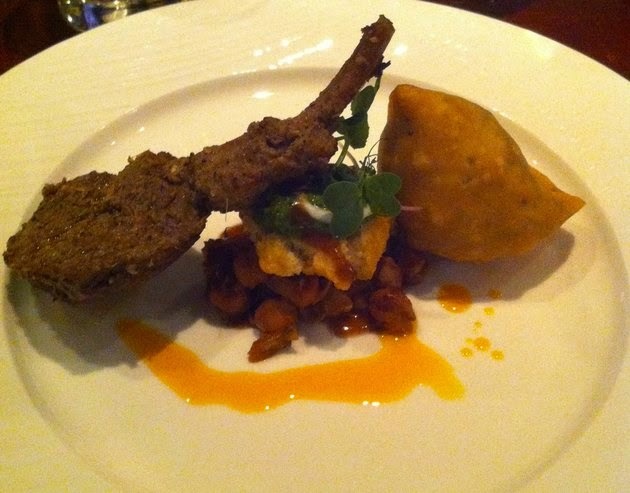 We swapped to a full body Piedmont from Italy for the next course of Chettinad Spiced Lamb Cutlet, Tea infused Chickpeas and Shoulder samosa. The lamb was excellent, still on the bone the meat had a beautiful texture, sweet and spicy all at the same time,while the samosa with a crisp casing offered a moist and flavoursome filling. The heat level was perfect for me but could be a tad on the hot side for others so let your waiter know if you don't like very spicy. We finished our meal with a Kafir Lime Leaf Panacotta, Wild Berry Ice cream. Delicate in colour and flavour but absolutely beautiful. The Kafir lime leaf added background flavour but was not too strong. 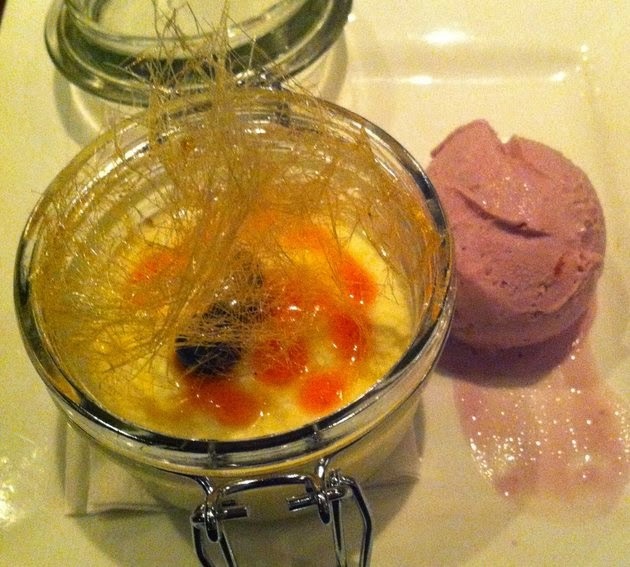 I love Indian food and I am pretty particular when it comes to what I like and I usually don't like dessert in Indian restaurants as they are normally far too sweet, But I loved this panacotta and "Hats off" to the Chef for taking a western dessert and turning it into his own. I also did like his approach in mixing spices from different regions for the other dishes and it worked. In all, the food was beautifully presented and all deliciously flavoured and cooked. Highly recommend. Thanks for providing precious information.